It is now twelve months to the day that I set myself the task of, for one full year, reading books only by straight, white, middle-class, Anglopone, cis male authors. During that time I read 144 books. The things I learned in my year of selective reading made me pretty glad to have persevered. First, while you might think finding books by such authors would be as easy as going in a bookstore and throwing a rock, it turns out it actually is. 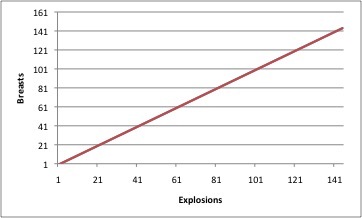 My other findings are graphed below. When contacted for comment, both Martin Amis and Ian McEwan banged on self-importantly and interminably. During the same period, my friend Jason Wyngarde performed a similar experiment with films. His findings were much the same, but he also uncovered a further pattern.